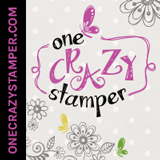 OneCrazyStamper is offering a $25 gift card to one lucky follower. -Become a follower of this blog. -Spread the word by putting this pic on your blog linking back to us. -Add your name into Mr. Linky. We are looking for guest Designers for the upcoming months. Guest spots are for 1 month and requirements are 2 projects using items sold in the OCS store. Benefits are a 25% discount to the OCS store (excludes copics), A guest DT blinkie, and getting to know some sweet gals that share your love for stamping & blogging! To apply please send 3 cards/projects to lora@onecrazystamper.com. We have blog candy, challenges, & lots of inspiration coming soon. We will start our first monthly challenge December 7th!